This year Toool will be presenting two picksets at the Last Hope conference in New York next week. The first pickset is the one you see above. It is a credit card sized set, and the tools can be snapped off. And already guaranteed to become a collectors item. It is called ‘the last hope’ emergency pickset, and the main idea is to carry it in your wallet. You will most likely use it when you lost your keys, or when you are assisting others who lost their keys. If you look at the back of the set, you see the edges of the set can be snapped off too, and are actually four separate tensioners. If you snap off all tools, you will end up with and eleven (!) piece pickset. As you can see, there are three basic picks, designed with the novice pickers in mind. For the real pro’s there is three thin and slim hook picks. Very useful for those pesky euro profile cylinders with their zig-zag keyways…. My role in getting these picksets to Hope was modest. Of course there was a lot of input from me on the shape of the picks (and some other stuff). But the main work has been done by Babak Javadi, one of the driving forces behind Toool.us at the moment. Do not underestimate the amount of work and financial investments that go into a project like this. I would also like to thank Babak’s girlfriend Kari for having to put up with Babak investing so much time in this project. A project that would not have happened without the help of two engineers from MIT who helped with the CAD. Thanks to Sam Duffley and Chris Pentacoff these picks came out the way we wanted them. A lot of work, but the end result is great. I am sure the Hope audience will love them…. * update July 16 on the source of the design. This entry was posted on Saturday, July 12th, 2008 at 22:51 and is filed under Uncategorized. You can follow any responses to this entry through the RSS 2.0 feed. You can leave a response, or trackback from your own site. The new picks look wonderful you and babak did a great job in getting everything order and look forward to seeing you guys there! Oh wow, the Hope picks look lovely – and smart to make them creditcard sized. Congratulations! Hey Barry, it was cool to read your “confession” article in 2600 – I just recently picked it up. First one I’ve bought in years, I suppose I should submit some more articles. 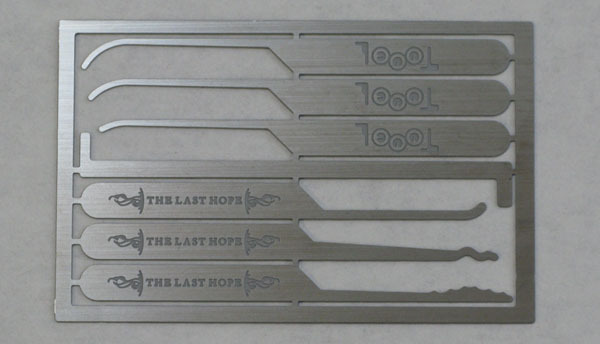 I can’t make it to The Last HOPE, unfortunately, but those picks look tasty. I did a similar business card design up in QCAD (free, runs on BSD/Linux) and sent it to Big Blue Saw. 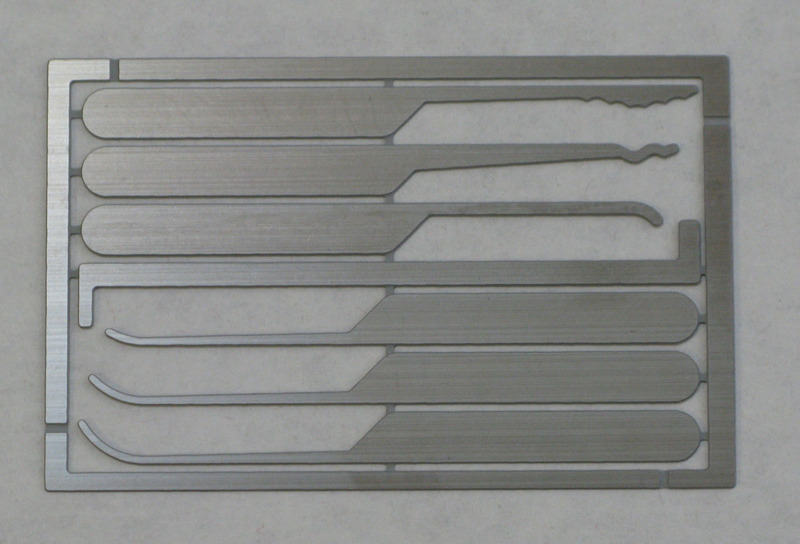 Their metal choices and thicknesses are all kind of crappy for making decent lock picks, but an emergency set made of aluminum (which we’re going with) would work once or twice in a pinch. Will you have the emergency and toool picksets available for sale after The Last HOPE? I second the request for having these on sale after the conference, or before, for those of us who can’t make it to NY. The picks will first be available at The Last HOPE, to be followed by DEFCON. Any sets left over after the HOPE conference may be made available for order, but we still need to figure out the best way to handle such transactions. That said, these picks are limited in quantity because of the investment involved so if you can’t make it to HOPE and REALLY want one, you should try to make arrangements to have a friend pick up a set for you. Do you think you could make the design available so people could make their own? It would allow people who can’t make it to HOPE this year still have a part of the last HOPE. Do you have prices for both sets? I can’t make it to HOPE, but maybe can talk someone into bringing them back for me. Fair enough. Cash permitting, I am planning on hitting DEFCON. My wife just quit her job, so I need to see how things look. Again, this is an awesome design. Vrocco: We are not sure yet what the price is going to be, but as always it will be very friendly priced…. The design seems of the first quality. I wait that youÂ´d increase the production, in order that those that we could not represent we have some opportunity to obtain them. I assure you that they are not going to stay any without selling in the conferences. Why not just release the CAD files? I have access to a machine shop, and can tool up a few using whatever scrap steel I can find around here. I’m sure there are others with the same or even better access than I have. And no, don’t hold your breath until we release the CAD files. It is not going to happen (any time soon). I’d love to own one of these, are you going to be selling them? About how much? If they aren’t expensive I’ll be glad to pick up one or two extra and send them off. (If they are expensive, there’s always paypal.) Look forward to meeting you Barry, I’ve been a fan of your work for a long time. Francis: We have not determined the price yet. How are the picks made? Water cutting, laser cutting or what? Nice looking finish, are those stainless? The credit card set looks fantastic, I’d love to get it when and if they become available online. Wow, those are very very nice. I’ve always wanted a set for emergencies and those would fit the bill perfectly. I’ve no way to make it to HOPE … so here’s hoping they’ll be available some other way. Nice work. What are the chances of getting a set if you are unalbe to make the conference? Is anyone willing to ship a set or two for a minimal payment (plus shipping cost)? I want them!!! Too bad I\’m not going to the conference! I’d love sets of these, but cannot make the conferances – Is anyone willing to be my friend and pick me up sets of these? I’d be very grateful for the help. Any idea when you’ll know the cost? The set looks awesome Barry, hopefully i can make it to hope. barry as on of your biggest fans here in the uk- i beg you to sell me one of them last hope sets, i will not use it i will frame it for future posterity lol. WOW oh wow is all i can say. they look so nice you all did a wonderful job in making these. i am bummed that i cant attend this year to get a set due to health reasons so i wish you all the best. Will you make some avaible to those of us who are not able to attend this year? Who needs a photo when someone left PDFs on their webserver? I\’m looking to buy one of these picksets. I haven\’t had the luqury of perusing this thread and so would appreciate any tips on how to easily aqcuiore a set. thanks. 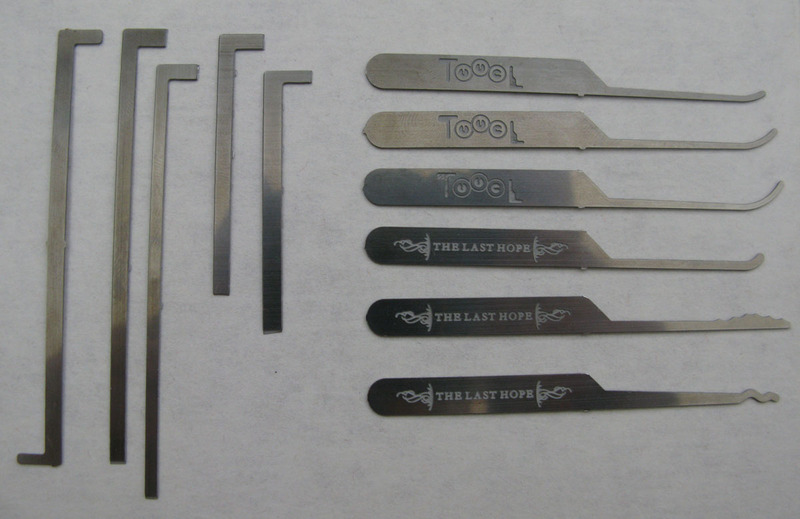 I want to buy The Last Hope Pickset. How can I do? I think your pick set is one of the most imaginative gadgets I’ve seen in ages. I’d really like to try one. If you decide to manufacture, talk to a metallurgist first and make an informed choice of alloy – they mustn’t fail! Also – protect a few designs. I think you have a very commercial product – good luck and let me know if you decide to sell prototypes please. Entries (RSS) and Comments (RSS). 64 queries. 0.729 seconds.